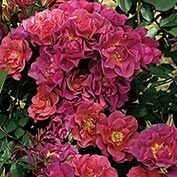 Cinco De Mayo Floribunda Rose | Gurney's Seed & Nursery Co. Huge clusters of mysteriously unique rusty red-orange and smoky lavender blooms just never stop poppin' open on this powerful floribunda. A true rainbow of colors, Cinco de Mayo is perfectly blendable with any color in the garden. The super-clean glossy-green foliage and delectable fragrance complement the exceptional flower power. U.S. Patent No. 21709. Comments: This seedling of Julia Child puts a whole new spin on 'Flower Power'. 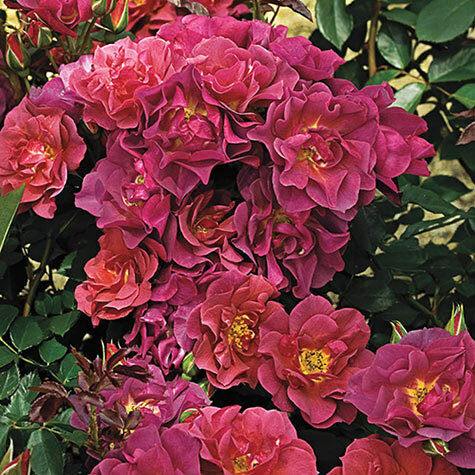 The clusters of blooms never stop popping open on this powerfully flowerful floribunda. Mysteriously colored and deliriously novel.....it's an indescribable blending of smoked lavender and rusty red-orange. 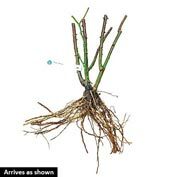 Yet it's perfectly blendable with any color in the garden, whether it's atop a rose tree, planted in mass or nestled among your favorite perennials.